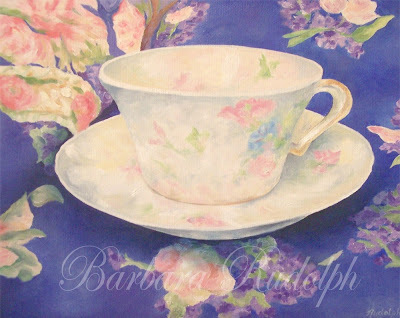 Barbara Rudolph Fine Art: STILL LIFE - "Nana's Cup"
Oil on canvas panel, "Nana's Cup." 11 x 14"
Barbara , this is i believe one of the most beautiful works i have ssen fron you . and you know i love your work . wow , i got breathless now !! Oh, thank you very much Caio. I guess I am feeling a little bit "nostalgic" about family things lately. My father has been quite ill, and we thought last night would be his last. We got him transferred to hospice this afternoon and he is a little better than he was last night. This little tea cup was from a set of my grandmother's. She gave one cup and saucer to each one of her daughter's and daughter-in-law. My mother had this for many years, and then gave it to me. It is so pretty, I thought it would be fun to paint, and it has meaning. Thank you again for your words.